I am a confirmed coward. Anyone who saw me one particular day in Nam can attest to that. There may have been other cowardice-ridden days I can’t remember…..thank God! And maybe I’m a little crazy, too. If the same circumstance were to occur again, I might be even more of a coward. I’ve always had a morbid fear of dentists. The fear was triggered by my introduction to Dr. Hyre in my small town. He was the family dentist and he made a small fortune taking care of my soft teeth that seemed to want to abandon my mouth at every possible opportunity. It was pretty scary when he would say, “Well, Grant, you have "x" cavities this trip!” You can do the math and substitute the "x" with any possible number short of 33 and you would probably be right. Every year, I spend too much time sitting in his chair with his drill whirring away in my mouth. The bills must have been terrible for my father. One day, to save him money, I insisted that Dr. Hyre drill my teeth with NO Novocain. Surely, that would save Dad some money and maybe I would feel less guilty about all of the dental expense. It was painful! Dr. Hyre tried talking me out of it and gave up. Dad thought it was funny. I learned a bad lesson in pain. On my first Nam trip, I lost a filling. Now, I knew that drilling could be an exceptionally painful exercise. But I was even more afraid of NOT having the dental stuff fixed. Surely that was an even worse hell! Clearly, I was caught between fear of dentists and fear of what would happen to me without dentists...an irresolvable dilemma. Dentists didn’t come out to the field and I got more worried about my tooth rotting away in the mean time ~ horrible pain just waiting to strike at the most inopportune time, I was sure. But we didn’t have any dentists in our area and I couldn’t just leave and go hunting for one. So I told the 2/9th Operations folks and the 1/35th artillery liaison that I needed a dentist and to please find one that I could get to and get back quickly. So I headed for Duc Pho and a dentist that, hopefully, would not be a dental nightmare. I don’t remember his name but I will always, always remember his dental expertise. 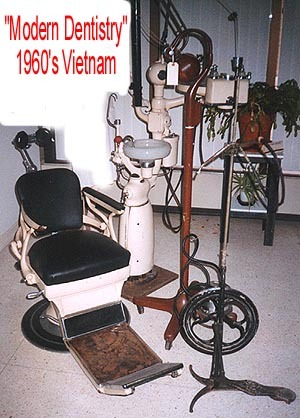 He told me that he had a Korean War vintage dental chair – all metal – with a belt-driven drill ~~ much slower than the modern drills. Hell, that was just like the old belt-driven drills that Dr. Hyre used when I was just a little kid! But it had one extra feature that Dr. Hyre never offered: it had a pretty bad electrical short somewhere. He said that I would feel a mild shock when the drill touched me. I thought I really needed the filling replaced before it erupted with a pain worse than death. And I was sure that a "mild shock" couldn’t be as bad as having Dr. Hyre drill and put in fillings without Novocain. So I sat down in the chair and told him to go ahead. "Do your worst. "’ Or something equally stupid, I muttered. A prophetic comment to be sure! He turned on the drill, approached the chair and reminded me again, "You’ll feel a mild shock. Just grip the arms of the chair and try not to move". The drill entered my mouth and I gripped the chair, ready for the "mild shock". When the shock hit, I could feel my hair on my head stand on end and every muscle in my body tense as a HUGE jolt ripped through my body. The epicenter of a HUGE pain was concentrated on a single tooth – the tooth that lost the filling. Every muscle locked in place. I couldn’t close my mouth or let go of the chair arms or move my head or move anything! I sat there and shook with the muscle tension that I couldn’t control. One of the interesting side effects of being electrocuted is that your chest muscles also freeze. Breathing stops. You run out of air. Quickly. Just when I thought I would be blessed with passing out, the dentist pulled the drill out of my mouth and the flow of electricity stopped. But before I could get a whole breath, the drill and my tooth were in contact again and I became part of a live current on its way to the ground. Did it tell you that it was a pulley-driven drill? That also meant that it operated at about 1/10th of the speed of the air-driven drill of today. It felt like he drilled on that single tooth for days. He stopped often but never long enough for me to catch my breath. And then it was over. I can’t remember ever being that exhausted. Every muscle had been worked hard and worked again and again. He was through and, much as I really wanted to kill him, it was hard enough to stagger back to the transient tent to collapse on the luxury accommodation of a cot. I slept the rest of the day, too exhausted to even think about finding my way back to the company. I got back to the safety of the company after I awakened; somewhere around sunset. If dentists scared me before, Army dentists terrified me now. Nothing I have ever experienced compared with the excruciating pain of being electrocuted from inside my own mouth.